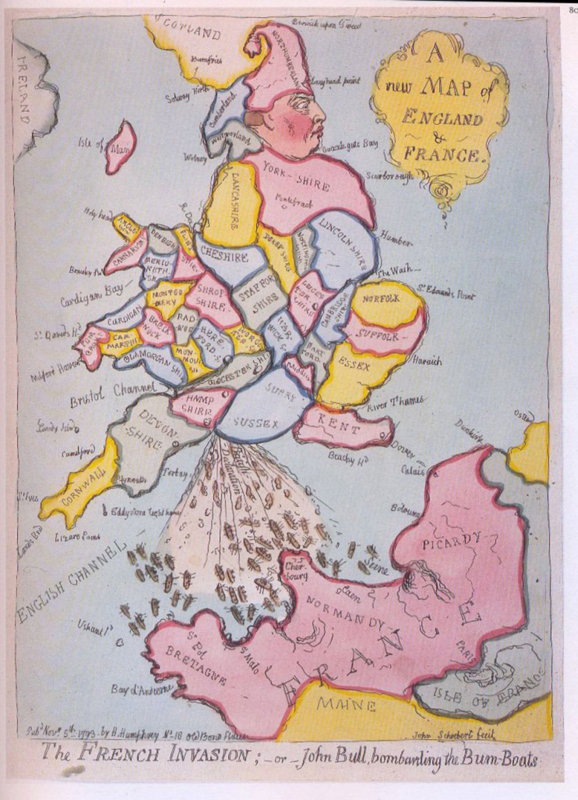 We’ve featured a number of fantastic satirical maps in MapCarte as artists, illustrators and commentators make good use of maps to convey a pithy message. Robert Dighton’s Geography Bewitched makes good use of Scotland as a map shape which was featured in MapCarte 43. 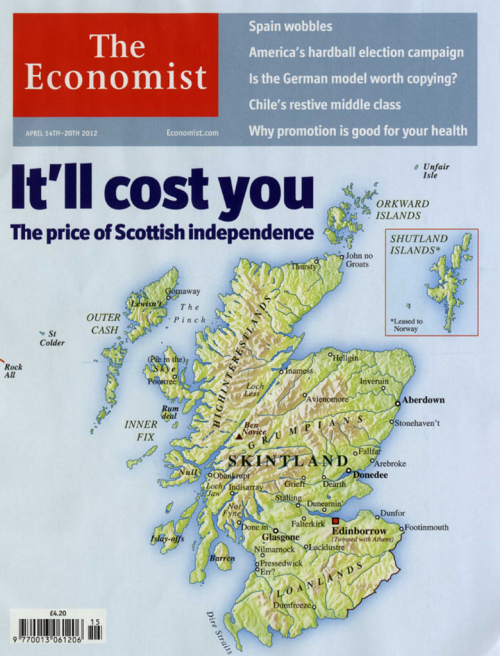 It was inevitable that today’s referendum on Scottish independence was also going to lead to some examples and The Economist’s 2012 effort shines brightly. Not without controversy, the map of Skintland shows the familiar shape and topography that hides the labels if you don’t look closely enough. Each city, town and physiographic label takes on a new meaning as a way of expressing the editorial comment of the potential result of Scotland’s economic plight if they vote for independence from the United Kingdom. Glasgow, Edinburgh and the highlands have been replaced by Glasgone, Edinborrow and Highinterestlands. The Shutland Islands have been leased to Norway and the Outer Hebrides are now know as the Outer Cash. In the 18th Century, Edinburgh was referred to as the Athens of the North because of its fine architecture and its Enlightenment role. Now it’s labelled as Twinned with Athens to parody the economic failures in Greece. It’s a well observed addition. Skintland is shown as an island and the coastal vignette carries on across the land border between England and Scotland to reinforce the message of being economically cast adrift. The map works because it’s well designed, not over-done and the joke is easily understood. The fact the map appears in The Economist makes it sit well and lends a certain gravitas to the ideas it represents rather than the impact it might have had in a tabloid publication. Of course, the map has received scorn from the proponents of the Yes vote and many others who saw it as a slight on Scotland and it’s people as you’d expect…but that’s the point of satire. Someone will always be offended! What the map, and subsequent reaction, shows is the strength of feeling that places have in our hearts. Names on maps become valubale and if we change them, albeit with the intention of humour, those with a vested interest can easily be hurt. As a way of generating sales the map does wonders. It also shows us that maps are sacred objects and one has to tread carefully with design to avoid such ire…or do it deliberately well precisely to provoke a response!